First of all it takes a lot of preparation to put together a Wine Tasting Tour. Second depending on what time of year it is, whether or not you get the winery you wanted. They may not have room for another reservation. So planning is of the optimum. Third is what is you wine tasting experience. Reds, Whites, Rose’? But putting that all to rest, and you got all your wine tasting tour appointments lined up. Grrrrreeat!!! Now I did not have to put today’s tastings together. I got lucky at the end of the day and the two ladies went to one of the wineries listed in my Wine News on this website www.myprivatedriver.net and it was on the map the ladies had. I picked up these two very nice and friendly ladies at Comfort Inn. They were ready to go. They had their itinerary ready and snacks in the back and were off at our agreed upon time. 1:00 p.m.
1:45 p.m. we were on our way a very short distance to the Envy Estate Winery. I really like their opening line on the Envy website. “Imagine an afternoon on a sun-drenched patio, laughing with great friends and tasting exciting new Napa Valley wines. Come on over, we’re waiting for you”. Wow! Can you imagine the feeling when you close your eyes, the warmth from the sun, the mixed aromas from the plants & flowers. Envy just opened up in 2007 and their Cabernet was recognised as one of the top 10 up and coming wines by Wine Spectator. Well the ladies really enjoyed the Envy Estate Winery and puchased some wines. It was 2:25 p.m. and we are on our way across the road to the Summers Estate Winery. From previous trips to the Summers Estate Winery I learned that from Monday thru Friday, 10:30 am to 1:00 pm the tastings are free. Otherwise it is a $10.00 wine tasting fee and is free if you purchase wine. My two guests also said that they really give you good size tastings. You would have to go to the Summers website for all their ratings. I noticed that there is a lot with all of their fine wines. It is 3:05 p.m. and the ladies return to their car and I had informed them that they now have a Wine Tasting apointment at the 2009 Winery of year for 2009, von Strasser Vinyards at 4pm. No we are on our way to another great winery at the end of Tubbs Lane. Chateau Montelena Winery. Enough can’t be said about a Winery who’s motto is “The philosophy at the chateau is simple: Make the best. Period”. This was a first time for me at the Chateau Montelena Winery. My guests even had me take pictures ( below) of them getting some barrels. So now it is 3;50 p.m. and we are on out way to von Strasser Estate Winery.We have plenty of time to get to our next appointment because it is in Calistoga just outside the city limits. My two guests are really having a good time now and is evident of the barrel incident (Just Kidding) So my guests wonder now what I do while I’m waiting for them to return to the car. Hmmm, lets see. I will have to get back to you on that one! It is now 4:00 p.m. and we made our appointed time at von Strasser. We were very pleased that we actually bumped into the Winemaker and the owner all in one person being Rudy von Strasser. As I said in the von Strasser article I think this Tasting room is the boutique of boutiques. When we pulled up to the tasting room the ladies use words like OMG & this is too cute, Look at all the wonderful moss growing on the trees, it is so beautiful here, etc etc. This is one of the most beautiful places to see nature at its best any time during the year. Even though it is cold and rainy yesterday the ambience and the beauty of the von Strasser property is breath taking. I hear the wine is also. 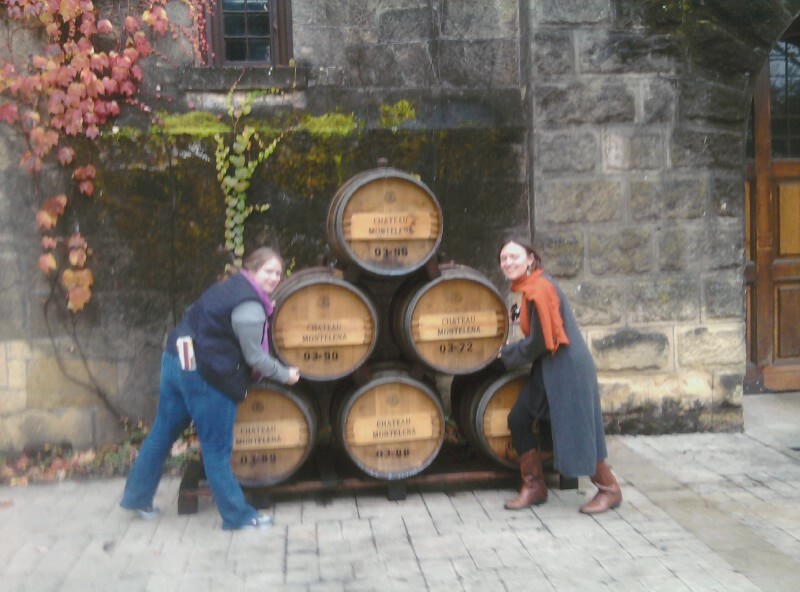 The ladies bought plenty of wine at von Strasser and all the wineries. Well all good things come to an end, including this Napa Valley Wine Tasting Tour with great guests. It is not only after 5 p.m. but quite dark. I dropped the ladies back at the Lodge of Calistoga and we said our goodbye’s. Everyone that reads this article should learn something from this. We went to five great wineries in four hours. It is easy to figure it out.